Many stock traders consider option trading strategies to be risky. This is likely due to the statements found in the media and on the internet which state that over 70 percent of options written expire worthless. However, if you approach them properly, and use the correct strategy, they can to some extent, reduce the risk of a trade. Like all investment vehicles, there is a time and a place to use option strategies. The approach discussed here works well in specific, but not all, situations. Obviously using options only work on stocks which are optionable. As a stock trader, it is a good practice to identify where you are going to sell your stock if the trade goes against you. Once you have done this, you have identified the amount of money per share you are willing to loose if you initiate the trade and it goes against you. Now it may happen that you are stopped out of the trade shortly after you enter the trade or during a subsequent pull back. This is a risk that all stock traders take on, when they initiate a position. To use this option trading strategy, you will be working with this pre defined loss and trying to identify if you could buy a call option for the same price which may produce a more favorable risk/reward ratio. 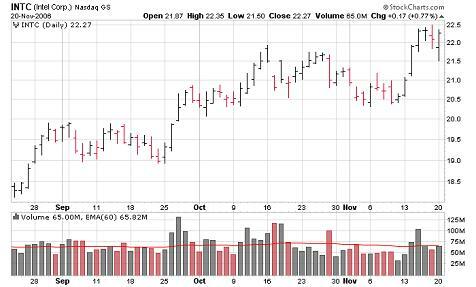 As an example let us look above at the three month daily stock chart of Intel (INTC) on Monday November 20, 2006. The stock could have been purchased for 22.29 just prior to the close. If you were to purchase INTC, it would be reasonable to place a sell stop at 20.29 which is just below the last major low. This would mean that you are willing to risk approximately $2.00 per share. If you believe that INTC is going higher but think there is a possibility that you may get stopped out along the way, you can purchase the April 22.50 call for about $1.50 instead of the stock. This information can easily be found on http://finance.yahoo.com. Thus, in this situation you have traded the probability of being stopped out for the probability that INTC will close above $24.00 by April 20, 2007. If INTC breaks below your sell price, you can sell or hold the option. The advantage of this option trading strategy is that in your mind you have already written off the loss. Thus, if INTC closes at $20.11 after one week had you purchased the stock you should have sold it, losing your position and $2.00 per share. However, by purchasing the option, you still have until April 20, 2007 to profit from this trade because normally, you would not have sold the option if it closed below your stop loss point. This strategy works best for stocks that are trading very close to an option strike price thus limiting the amount of intrinsic value in the option price. It is also aimed more at position traders and not short term traders. Buying put options in bear markets and selling covered calls are two other option trading strategies which you may want to investigate.